Here is a list of just some of the services we offer. For more information please call. • Residential and Commercial ON-SITE SERVICE - We can come to your business or home**. • Comptia A+ Certified PC Hardware Experts • PC Software Specialists - MS Office, Adobe, Etc. 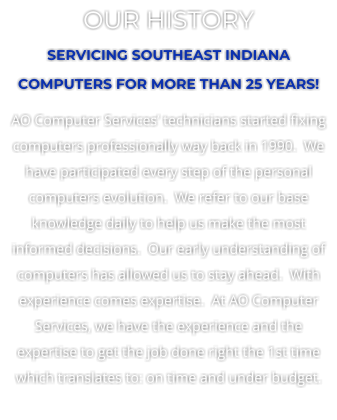 • Virus / MAL Ware / SPY Ware / Worm removal / prevention services • New computers and laptops - call for pricing and availability • Certified One on one training of numerous software packages**. • Microsoft Certified Systems Engineers available for Network Design / Network Security • Professional Web Design / Custom application programming • SEO (Search Engine Optimization) for your web site • Marketing Consultation - How to market your company on the Internet and get results • DATA Recovery Experts (Hard Drives, Memory Sticks, etc.) • Surveillance Systems / Video Conferencing / WEB Casting / VOiP ** ON-SITE Service and One on one training available in certain areas only. Call for pricing and availability.